Homeowners and local paint connoisseurs help us overcome chromaphobia for a façade that pops. The Joseph G. Birch House in Providence’s Elmwood neighborhood has details worth flaunting: patterned shingles, clapboard, decorative gable accents. However, a series of unfortunate events — including a misguided pink, off-white and beige paint job and a 2016 foreclosure — were concealing its grandeur. In 2016, the Providence Revolving Fund (PRF) stepped in to give this blighted beauty a second chance at glory. One of PRF’s rehabilitation priorities was to honor the home’s original nineteenth-century palette. “The director of the Providence Revolving Fund did some paint scrapings to get to the oldest layer,” says Harry Adler, owner of Adler’s Design Center and Hardware on the East Side of Providence, who consulted on the project. Based on the scrapings, Adler identified modern colors that mirrored the historic shades. 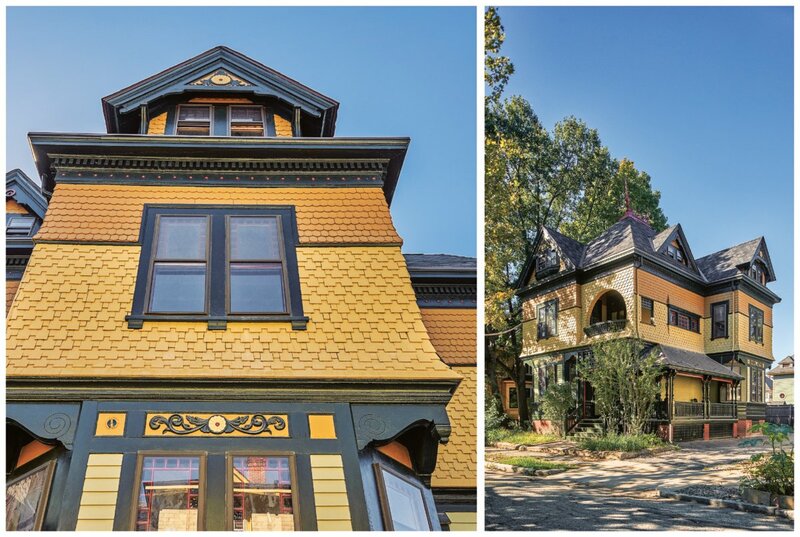 Historically inspired color choices helped restore this elegant Queen Anne to its original splendor. Photography by Tony Luong.